West Tamar Talk: How Did European Wasps First Enter Tasmania? How Did European Wasps First Enter Tasmania? I wanted to discover if there was any truth in the old stories about how European wasps first came to Tasmania, how they thrived and spread across Tasmania, the Bass Strait Islands and eventually to mainland Australia. Two European wasps nests were first discovered at Battery Point Hobart in 1959 by persons referred to as 'anonymous'. Vespula wasps had been in New Zealand since 1927 and the accepted story is the wasps had migrated from New Zealand possibly in freight. There is no proof of this entry path and it has never been substantiated. Incredibly, the introduced bumble bee (bombus terrestris) was also first discovered at Battery Point Hobart in 1992. Between 1948 and 1994 the CSIRO had an entomology lab at Stowell Avenue right in the middle of Battery Point. The lab was housed in the 1833 'Stowell Mansion' an old residence and ex-hospital that is supposed to be haunted. The old wasp stories say that vespula wasps were introduced to combat sirex wood wasps (sirex noctilius). Sirex wasps can devastate entire pine plantations by drilling into the top of pine trees as part of their reproductive cycle. 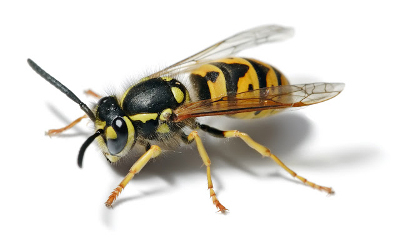 Vespula wasps are not known as predators of sirex wasps, so they would not have been introduced as a direct biological control agent for sirex wasps. Vespula wasps are 'social' insects and sirex wasps are not. It's possible that CSIRO entomologists imported European wasps in order to rapidly breed predator wasps they could release against sirex wasps. Was a breeding program carried-out at the Battery Point 'insectarium' with some queens escaping in 1958-59? Mr Taylor may have been writing about the national sirex program and not wasps imported into Tasmania before 1962. Why did the CSIRO entomology department at Stowell Avenue have no available records detailing their response to the invasive vespula wasps discovered in their own suburb? It appears the CSIRO did not mention vespula wasps in any Tasmanian publications for at least a decade after 1959. Can these questions be verified by a retired entomologist? In the 1940s sirex wasps wiped out one third of New Zealand's pine trees, before almost destroying the Tasmanian pine industry in the 1950s. When the wasp was found in Victoria in 1960 a major effort was initiated to control it, by felling and burning infected trees. When this didn't work the hunt began for a biocontrol agent. The CSIRO response against sirex was ramped-up in 1960 with a global research effort that eventually led to the breakthrough by R.A. Bedding of using parasitic nematodes to control sirex wasps. Which agency carried-out that 3 year eradication campaign? Apparently the Tasmanian or Commonwealth government. The European wasp had found an ideal home in Tasmania with hives operating throughout the year and growing to the largest hives ever found. Understanding sirex wasps helps us understand the war against sirex wasps. Sirex wasps are in a symbiotic relationship with a wood decay fungus called 'Amylostereum areolatum'. The wasp kills healthy pine trees by injecting the cellulose degrading fungus as well as a toxic venom produced by the wasps into the tree. The fungus is carried in a special sack by the female wasp. It spreads through the tree and provides food for the burrowing sirex larvae. The female sirex drills into the pine wood using a dagger-like ovispositor at the back of her body. She then injects fungi, venom and eggs into the wood with her ovispositor. The Sirex ovispositor contains higher levels of zinc and manganese than other insect cells. (5) The sirex female is armed and dangerous to pine trees. Sirex predator wasps may have been bred at Stowell Avenue using vespula egg cells injected with Amylostereum areolatum fungi. This would produced more predator wasps than using individual sirex drills in wood. This needs further investigation. It's time the CSIRO applied the same enthusiasm to eradicating vespula wasps in Australia as they have to controlling sirex wasps. It must be possible to return the Tasmanian bush to the way it evolved without an overlay of human-introduced pests. I think Australians can do it. In researching this article I was impressed at how complex biocontrol in the real world is and how marginal the victories can be. For example the sirex program requires the on-going re-seeding of parasitic nematodes into the tops of pine trees. 4. The introduction and establishment of insect parasitoids to control Sirex noctilio in Australia by K. L. Taylor 1976. 5. Manganese and zinc in the ovipositors and mandibles of hymenopterous insects by Quickie et al 1998.
by K.L. Taylor Division of Entomology, CSIRO 1976. 7. Behavioral responses of parasites to the symbiotic fungus associated with Sirex noctilio by A. A. Fernandez et al 2014. 8. Classical Biological Control of Arthropods in Australia by D.F. Waterhouse and D.P.A. Sands CSIRO Entomology 2001.